Schooling has become increasingly complex in purpose and structure and therefore requires appropriate forms of leadership to address this challenge. One current leadership approach that is receiving national and global attention is distributive leadership. A qualitative approach was employed to investigate teachers' experiences and perceptions of the practice of distributive leadership in public primary schools in Soweto. Soweto is a township in Johannesburg, South Africa, which comprises predominantly black African residents. The findings revealed that leadership in Soweto primary schools is rooted in classical leadership practices and that any potential for the practice of distributive leadership is hindered by autocratic styles of leadership, hierarchical structures, and non-participative decision-making. While the importance of the role of effective leadership in contemporary school reform has been highlighted (Harris & Muijs, 2005), there is a continuing global debate about the leadership approaches that are most conducive to sustainable school improvement. The view that leadership is vested in positional leaders, such as principals, has been challenged (Gronn, 2003; Harris, 2005a) and has led to educational theorists, reformers and practitioners calling for a re-conceptualisation of school leadership (Grant & Singh, 2009; Harris & Lambert, 2003; Harris & Muijs, 2005; Spillane, 2009). There is a new paradigm where school leadership is viewed as "a practice whose responsibilities, functions and actions are shared by principals and teachers" (Sergiovanni, 2005:42). According to Spillane, Diamond, Sherer and Coldren (2005), school research has focused mainly on leadership structures, roles, routines and arrangements and neglected leadership practice. In this article, we illuminate leadership practice with a view to understanding and improving the practice of leadership in South African schools. Spillane, Halverson and Diamond (2001:27) suggest that in the study of leadership practice a variety of "mediational means" are necessary to study leaders in action. In this study we use a distributive perspective as an analytical framework since it draws attention towards leadership as a practice rather than leadership as a role (Harris & Spillane, 2008). Crawford (2005) emphasises that schooling is becoming more complex in structure and purpose and therefore organisational change and development will require more fluid and distributed forms of leadership. Indeed, in the current global discourse concerning alternative approaches to educational change, distributive leadership has received wide acclaim (Hargreaves & Fink, 2008). Orthodox leadership models are seen as inadequate in the face of continuous change in the educational environment, and have been criticised for being unable to sustain school improvement (Harris, 2005a). In the context of post-modernism, South African leaders should embrace the views of stakeholders and move away from a reliance on hierarchical structures, which are insignificant in a fluid organisation (Bush, 2007). A more inclusive, participative and consultative, approach is appropriate for a democratic South Africa (Starratt, cited in Bush, 2007; Van der Mescht & Tyala, 2008). Gronn (2003) asserts that the current context of the expansion and intensification of the work of the principal, has led to the emergence of distributive forms of leadership. This trend regarding the expansion and increasing complexity of the work of principals is also evident in South African schools (Mestry & Grobler, 2003; Steyn, 2002a). In addition, it must also be borne in mind that principals in South African schools operate in a volatile political context as the country shifts from the apartheid system to a democracy. Radical and continuous changes such as technological and demographic shifts, decentralisation, issues of accountability, societal violence, economic changes and new legislation have all contributed to the demands facing South African principals (Mestry, 2009). In a knowledge-intensive enterprise such as teaching and learning it is impossible to complete complex tasks without distributing leadership responsibility (Hartley, 2007). Gronn (2003) contends that the leader-follower dualism no longer adequately describes the emerging reality in schools. Harris (2005b) refers to distributive leadership as the current leadership practice emerging in schools. As such, distributive leadership is becoming the norm. Hence, the interest in distributive leadership in South African schools is both relevant and timely. Since research is dominated by studies on "focused" (Gronn, 2003:27) leadership, this study offers a different lens through which to view the concept of leadership. Harris and Muijs (2005:5) refer to the neglect of "the kinds of leadership that can be distributed across many roles and functions in the school" as a 'blind spot' in the research literature. In South Africa, research into distributive leadership has been pioneered by Grant (2008), Grant, Gardner, Kajee, Moodley and Somaroo (2010) and Grant and Singh (2009). This study contributes to this emerging literature. We explore the experiences and perceptions of teachers regarding the phenomenon of distributive leadership rather than address the impact of distributive leadership on school effectiveness. Our research question is therefore, What are teachers' experiences and perceptions of the practice of distributive leadership in public primary schools in Soweto? It is argued by Fletcher and Kaufer (cited in Leithwood, Day, Sammons, Harris & Hopkins, 2006:47), that in the distributive perspective, leadership is potentially enacted by people at different hierarchical levels in the organisation, in contrast to a view of leadership as a set of personal characteristics or attributes found in people at the top of the hierarchy. Hence, the distributive perspective opens up the possibility for "every person" to act as a leader in one way or another (Goleman, cited in Harris & Muijs, 2005:28). The movement away from hierarchical structures of leadership towards the distribution of leadership is represented diagrammatically (Figure 1) by Gold (2004). Classical solo leadership lies at one extreme. At the other extreme is the view of leadership as a collective practice, which rejects the focus on individuals or even management teams (Gold, 2004). The movement from the focus on a solo leader towards collective or team leadership resembles the direction in which South African schools are expected to move. Gronn (2003) and Spillane et al. (2001) in particular, are helpful in conceptualising distributive leadership. Gronn (2003:85) draws upon the Activity Theory of Engestrom (1999), which emphasizes leadership as a collective phenomenon, the centrality of the division of labour, the interdependency of relationships and the notion of emergent activities. We decided to ground this study in Activity Theory, which posits that "the potential for leadership is present in the flow of activities in which a set of organisation members find themselves enmeshed" (Gronn, cited in Harris, 2005a:163). Leadership becomes fluid, emergent and open rather than a fixed phenomenon (Gronn, cited in Harris, 2003a:76). Spillane views distributed leadership as a social distribution of leadership where the leadership function stretches over the work of numerous individuals and the task is achieved through the interaction of many leaders (Spillane et al., cited in Leithwood et al., 2006:47). The individual is therefore not the unit of analysis in the study of leadership, but rather practice or activity is viewed as being the appropriate unit of analysis (Spillane et al., 2001). In this instance leadership is concerned with inter-- dependency rather than dependency and embraces a variety of leaders in diverse roles who share leadership responsibility (Harris, 2005b). Distributive leadership extends the boundaries of leadership giving rise to the concept of teacher leadership. Teacher leadership recognises the leadership capability of all organisational members and supports leadership as a form of agency that can be distributed (Harris, 2003b). Extending leadership opportunities to teachers is powerful in that it acknowledges the diverse and important leadership roles that teachers undertake daily and how these tasks positively enhance teaching (Harris & Lambert, 2003). As the roles between leaders and followers blur, teachers can be viewed as "co-producers of leadership" (Harris, 2005b:11). Historically, most South African teachers have been both passive and dependent (Moloi, 2005). Distributive leadership offers a shift to a liberating culture characterised by "collective action, empowerment and shared agency" (Harris, 2003b:317). In a distributive leadership environment teachers take on greater leadership responsibility. This raises the question of the role of the school principal. The role of the principal in a distributive leadership environment In spite of distributive leadership contributing to flatter hierarchies and the empowerment of teachers, principals remain important due to their symbolic and positional authority (Harris, 2007). Hence, distributive leadership does not seek to eradicate formal leadership structures but presumes that a relationship exists "between vertical and lateral leadership processes" and that the focus of leadership is on interaction between these processes (Leithwood et al., cited in Naicker & Mestry, 2011:101). Principals play an important role in facilitating distributive leadership by creating a suitable school climate and promoting the organisational conditions that are necessary for distributive leadership to flourish (Harris & Lambert, 2003). Such conditions include the redistribution of power and authority as well as the building of trust relationships (Hopkins & Jackson, 2003). Furthermore, principals can establish a collaborative school culture (Glanz, 2006) and create a shared culture of expectations through the use of individual expertise (Harris & Muijs, 2005). By adopting a distributive leadership approach, principals can institutionalise a leadership-centred school culture and can play a role in enhancing and sustaining leadership. Fullan (2001:136) asserts that in a complex culture, the main role of leadership is to harness the "collective capacity" of many individuals who, working together, can "challenge difficult circumstances". Furthermore, Fullan (2001) contends that good leaders are those who develop leaders at other levels for the future of the system as a whole. In this context the principal is seen to be a "leader of leaders" (Harris & Lambert, 2003:45). We used a generic qualitative approach to explore the phenomenon of distributive leadership. Generic qualitative research studies seek "to discover and understand a phenomenon, a process, or the perspectives and worldviews of the people involved" (Merriam, 1998:11). In this study, we sought to understand the perspectives and worldviews of teachers regarding distributive leadership in selected Soweto public primary schools. The data were collected by means of an in-depth focus group interview in each of three primary schools, and document analysis. A feature of focus group interviews is the group interaction that leads to the generation of data which cannot be achieved in individual interviews (Nieuwenhuis, 2007). All public schools in the Gauteng province are subjected to whole school evaluation by the Gauteng Department of Education (GDE). Based on their evaluation rating, schools are categorised as follows: category one (schools needing urgent attention), category two (schools needing support), category three (schools performing at an acceptable level), category four (good schools) and category five (outstanding schools). From the most recent list received from the GDE there are no schools ranked in categories four and five. We used purposive sampling to select the three schools from the remaining categories: School one is a category three school, school two a category one school and school three a category two school. There were 15 participants in total of whom 12 were females and three males. Seven of the participants were aged between 30 and 39 years, four between 40 and 49 years and four were older than 49 years. All participants were post level one teachers who did not hold formal leadership positions at the time of the research. We selected teachers who possessed a minimum of five years of teaching experience. Open-ended questions were used to explore the concept of leadership from the participants' perspective and thereafter semi-structured questions allowed for probing and extended responses on aspects pertaining to distributive leadership. Document analysis was also undertaken in order to complement the interview findings. Documents, such as those relating to the distribution of responsibilities and committee or team structures, were analysed. We piloted our interview approach to ensure that it gave us entrance to the kind of data we were looking for. The interviews were recorded in order to reproduce the participants' original words. Member checks were conducted so that the research participants in each focus group could verify their particular contributions. Validity was also promoted by having colleagues peer review our research procedures and the congruency of the findings with the raw data (Merriam, 2002). Although this study is limited to only three public primary schools in Soweto, it is likely that many other schools will see themselves in this account too. The data were analysed using Tesch's method (cited in Creswell, 2009:186) which involves the identification and coding of topics, the development of conceptual categories and the formulation of themes and sub-themes. The interviewees' informed consent to participate in the study was obtained and participants' anonymity and the confidentiality of sources assured. The main finding is that there is negligible evidence of distributive leadership in the three Soweto primary schools. Four themes emerged and these are presented, together with their respective sub-themes, in Table 1. A discussion of the themes, together with their respective sub-themes, follows. Codes are used to identify the three schools and the participants in the focus groups at each school as follows: S1 refers to school one in the methodology section, and so on. T1 refers to teacher one in a particular school's focus group, and so on. So, for example - S2,T5 - refers to school two and teacher five in that school. "Most of the times he's [the principal] the one who dominate[s]. He use[d] to tell us that we need to do one, two, three. And then hierarchy, yes, it is still there ... Normally we are being told what we must do..." (S1,T5). "I think if maybe we can be given a chance of viewing our understanding and saying whatever we think, especially when coming to the developments in a school, to say I think if we can do one, two, three we'll see the progress. But then you are not being given that chance to say that. Because you are not the leader you can't say that. It must pass through me [the principal] before you can do whatever you do, it must pass through me and if I take it I take it, if I don't take it I'm not taking it" (S3,T2). It appears from the data that a transition to democratic leadership styles has not transpired in these schools in Soweto. Democratic leadership is consultative, participative and inclusionary (Starratt, cited in Bush, 2007:399). This is in contrast to the type of leadership described by the participants in their schools which appears to be managerial leadership and can be described as "authoritarian, hierarchical and inaccessible management styles" where the authority of the principal is conceived as "god-given" and "juridical" (McLennan & Thurlow, cited in Bush, 2007:395). The models of schooling that are emerging in the twenty-first century are based on collaboration and networking which require lateral rather than vertical leadership practices (Harris, 2005a). This view is supported by Hargreaves and Fink (2008:232) who propose that leaders move away from hierarchical structures to communities, networks or webs premised on shared collaboration, where their function is to "connect and contribute" rather than to "command and control". "... as a team we agreed we trusted with each other. We contributed our views on those eh policies, but at the end they were rejected ... I think even if you are working in committees somewhere somehow we are still being oppressed because when we agree on something at the end it is being rejected" (S1,T5). "... You've got limited say because at the same time being a chairperson of that committee you cannot expose yourself to some of the things which you need to be exposed to or come with suggestions. Then when taken there, top level then they being crushed, crushed, crushed and then at the end that opportunity that you, you cannot even make it" (S3,T3). The examples cited above illustrate that principals do not respect the decisions made by school committees. Distribution involves "relinquishing one's role as ultimate decision-maker, trusting others to make the right decisions" (MacBeath, 2005:355). Principals appear to be practising "contrived collegiality" where committees are formed but the principal has decision-making authority to overrule or ignore committee decisions (Glanz, 2006:2). Thus, while on the surface there appears to be teamwork in the schools, beneath the surface decision-making is not distributed and power remains largely in the domain of the SMT. Grant et al. (2010:414) confirms that an- indicator of "authentic teamwork" is the participation of teachers in decision-making processes. According to Walker (cited in Van der Mescht & Tyala, 2008:223), "it is easy to form so-called teams and then claim that the school is structured colla-boratively, but unless there are major shifts in thinking ... little real change will result". Perhaps the cultural and structural conditions essential to teamwork have not been established in these schools in Soweto; structural conditions referring to the "logistical arrangements" in schools and cultural conditions referring to the climate, culture and ethos that exists (Van der Mescht & Tyala, 2008:223). "As I said, communication breakdown in the school, because we don't have, you know, when you are a leader you involve, as I said, you involve everybody being the stakeholders of the school. Everybody must take part so but if there is a certain group ofpeople who are doing things on their own then there won't be smooth running of a school" (S3,T2). It appears from the data that teachers do not have a 'voice' in decision-making. A participant posited that: "We don't have [a voice]. Sometimes when you say things you want to say that comes from your heart then they [the leaders] don't even take it (S2,T4). Sackney and Mitchell (cited in Bush, 2007:399-400) emphasise the significance of "voice" in post-modern leadership. Participative decision-making fulfils the need of teachers to contribute to matters which affect them and can play a role in the effective functioning of the school (Ibtesam, 2005; Van Deventer, 2003). Furthermore, the involvement of stakeholders in decision-making is essential in dealing with the complex challenges that schools face (Van Deventer, 2003). A participative approach is important in the current school context since it builds staff relations and reduces the workload of the principal through the distribution of leadership functions and roles (Sergiovanni, cited in Bush, 2007:397). "I think power sharing is very, very vital because if you share responsibilities you won't encounter any problem at any time because people are there to attend to different activities within the school, concerning the school curriculum" (S1,T2). Power sharing enables a movement away from hierarchical control to peer control (Harris & Muijs, 2005:38) and is therefore essential to distributive leadership and teacher leadership. Alternate power relationships are therefore needed "where the distinctions between followers and leaders tend to blur" (Harris, 2003a:77). This is problematic since schools are hierarchical structures with legitimate power accrued to the principal as the positional leader (Bush, 2003). Hence, principals are accorded rights in decision-making and policy formulation (Bush, 2003). Distributive leadership- presents a threat to the status quo (Harris & Muijs, 2005). In the new paradigm principals are required to share decision-making power with staff and distribute both responsibility and power for leadership widely throughout the school (Helm, cited in Harris, 2005b:168). Activity Theory posits leadership as a collective phenomenon. In order for activities to become units of analysis, a decentring of the individual leader must occur (Gronn, 2003). This can be facilitated by principals who adopt collaborative and participative leadership styles where power is shared with other key players in the school community and where participative decision-making is a reality. Distributive leadership calls for principals who employ participative leadership approaches. Participative leadership places emphasis on group decision-making, democratic principles and the leadership contributions of all stakeholders in the context of site-based management (SBM) (Bush, 2007). The findings point to negative school climates which are detrimental to staff relationships, teacher morale, job satisfaction levels and teaching and learning. A participant commented: "The atmosphere creates hateracy amongst us staff ... there will be conflict because of one, two, three ... There is no trust"(S1,T1). In an activity system such as a school, poor human relations between the teachers will hinder the distribution of leadership. Building trust relationships is an important focus area for the principal because by promoting trust relationships, leaders can "unite the school around shared values and higher-order purposes" (Hopkins & Jackson, 2003:101). Trust is an important condition that enhances distributive leadership (Mac-Beath, 2005). From the data we get a picture of low teacher morale in the three schools. The participants used words such as "disturbed", "not happy", "not satisfied", "discouraging", "demotivating" and "disillusioned" to describe the way they felt at school. If teachers perceive that their needs are not being met, this affects their morale negatively (Steyn, 2002b). By empowering teachers and giving them a voice in decisions that affect them, principals may raise their morale (Kruger & Steinmann, 2003). The morale of teachers may also be raised by granting them more autonomy, by according them professional respect and by giving them recognition and praise for their efforts (Steyn, 2002b). The low teacher morale appears to impact negatively on the participants' job satisfaction. A participant expressed: "Fou even think of staying at home, resigning, forget about everything" (S3,T2), while another participant asserted that due to the teachers' lack of 'voice' in matters pertaining to the school, "it makes people including myself sometimes even to hate this profession itself" (S1,T5). The unhappy atmosphere has resulted in stress and absenteeism as the following statement shows: "Fou'll be stressed and you become sick. There's no week where you can find us 100% in the school" (S1,T3). The data indicate that the respondents cannot perform to their full potential in the current school climate. This has serious consequences for learner achievement. According to Yong (cited in Steyn, 2002b:84), one of the most influential factors on school effectiveness is the enthusiasm and motivation of teachers which enables their total commitment to teaching. Teachers play an important role in "sustaining, enhancing or even decreasing learner motivation" (Atkinson, cited in Steyn, 2002b:84). The principal can play a role as an instructional leader who increases student achievement by influencing the school climate in a positive manner (Ibtesam, 2005). "Then, now as we are closed out, our views are not allowed, are not accepted, is a problem because even when we work we don't perform to the maximum. I think it would benefit a lot if maybe we were allowed to contribute our views on the running of the school" (S1,T5). Another participant expressed a fear of victimisation: "So you keep quiet. You can even see this is wrong but you keep quiet because you know if I say this. that person is going to get back at me" (S2,T1). Participants at S1 and S2 also raised the issue of a lack of transparency at their schools. A participant claimed: ". there's no transparency. Some things are hidden "..."Our leaders must tell us everything on time and mustn't hide some things from us. They must be honest with us" (S2,T4). At S3, the unavailability of the minutes of meetings is not in the interest of enhancing transparency and accountability (Denscombe, 2007). Establishing a collaborative school environment and open communication is considered the single most important factor for school improvement (Ibtesam, 2005). However, open communication requires a climate of trust and understanding between people in the work environment (Fielding, 2006), which the data show is absent at these schools. Five barriers that impede teacher leadership were identified. One of these barriers was inadequate opportunities for teacher leadership. This was evident at S2 and S3. Teachers at S2 experienced difficulty in stating what leadership opportunities they had and there was evidence of only one school committee, namely, a sports committee. Regarding leadership opportunities for teachers, a participant was straightforward: "So far we don't have any opportunities (laughs)" (S3,T3). Another respondent in the same school conveyed that opportunities for leadership were limited and that there was role confusion in committees. Empowering teachers and providing them with leadership opportunities is premised upon the notion that if schools want to improve on the way learners are taught, then they, schools, should provide teachers with opportunities to innovate, grow professionally and collaborate (Harris & Muijs, 2005). "When we do preparations we don't do it in a group. We do that individually. So your expertise is yours only, because you cannot impart the knowledge to other teachers.being just an ordinary post level one teacher you are not given a chance for exposure" (S3,T2). When teachers work individually, an "isolated professional culture" is created, which is a common barrier to the establishment of teacher leadership in schools (Leithwood, Jantzi & Steinbach, 2003:198). In a culture of individual work practices there are less opportunities for teachers to provide leadership to their peers and teachers are not motivated to develop their own leadership capacities (Leithwood et al., 2003). The heavy workload of teachers might hinder their ability to take on leadership tasks and responsibilities. A participant commented: "At the moment because of our large workload some of the things that even we want to take the leadership there will be somehow too much ." (S3,T3). Another barrier to teacher leadership that came to the fore was the power relations between teachers and members of the SMT. A participant remarked: "I think the manager will be a problem because he will not accept and welcome everyone, everyone, except those who maybe feel they are very close to him" (S1,T3). Feelings of insecurity that principals experience due to teachers taking on leadership roles may be reduced if principals are encouraged to view themselves as a "leader of leaders" (Harris & Lambert, 2003:43). "Even it could be possible if each and every one ofus is trained on the leadership and management because sometimes we might have a conflict of ideas, which might end up resulting in us, maybe some of us, having a conflict amongst ourselves" (S1,T5). The professional development of teachers in leadership is widely supported in the literature (Grant, 2008; Hopkins & Jackson, 2003; Spillane et al., 2001). 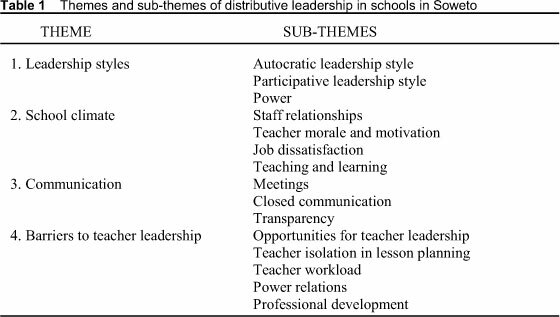 This study indicates that leadership in the three Soweto primary schools is rooted in classical leadership practices and that a shift from autocratic styles of leadership,- hierarchical structures and non-participative decision-making is needed if distributive leadership is to develop. In order to facilitate this shift towards more collegial and collaborative leadership styles, it is recommended that the Department of Education provide professional development training programmes and workshops for principals and teachers. Such programmes should focus on distributive leadership which promotes teacher leadership and their role in school transformation. In addition, principals need to learn that they can, and how to, share power and decision-making with others. Furthermore, principals should be made aware of the vital role that they can play in establishing both a collaborative and leadership-centred school culture. Based on the distributive leadership approach, a principal alone cannot be held accountable for the leadership and management of a school. It is recommended that accountability be shared with those role players whose joint endeavours determine school outcomes. The principals in this study avoided power-sharing, the devolution of decision-making and the granting of autonomy to teachers and teams. This reluctance may be influenced by current demands for accountability being placed exclusively on principals' shoulders by higher authorities. This practice needs to be reviewed in the interest of furthering distributive leadership. The literature suggests that distributive leadership can provide a beneficial approach to educational change in schools. If distributive forms of leadership are integrated into the complementary vertical leadership structure of schools, and structures such as networks or webs can be introduced, the principal's role can more easily become that of a facilitator, mediator, coach and supporter, thereby encouraging a more collegial school atmosphere (Naicker & Mestry, 2011). We concur with Hargreaves and Fink (2008) that distributive leadership can be extended to include democratic public and professional involvement in education. Ultimately, democratic nations like South Africa can employ distributive leadership towards the attainment of democratic citizenship and the social vision to address issues of "economic creativity and sustainability, ecological survival and fundamental human rights" (Hargreaves & Fink, 2008:239). Distributive leadership is a new and emerging field of study in education leadership and management in South Africa. Further research can be undertaken to explore the effect of distributive leadership on learner achievement. In supporting the need for a re-conceptualisation of leadership practice in the twenty-first century and a search for alternate and relevant models of leadership, this research suggests that distributive leadership has much to offer schools.